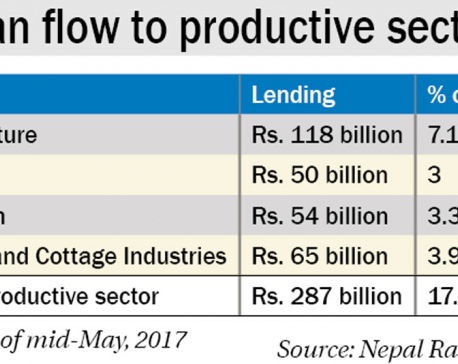 KATHMANDU, April 20: The latest deposit mobilization and loan disbursement figures of commercial banks indicate that banks are still in tight lending condition. Commercial banks added Rs 72 million in deposits and disbursed loans worth Rs 68 billion in the review period which means banks are not yet in a comfortable lending position. A compilation of deposit and lending figures of 28 commercial banks released by Nepal Bankers Association shows that outstanding deposit (local currency) of commercial banks is Rs 2,190 billion, while their total lending is Rs 1,958 billion as of third quarter-end (March 13). While banks have slowed down their lending in the third quarter, the difference between the deposit and credit growth is not much wide. However, the mismatch between deposit and credit growth ended in the third quarter. In the second quarter, the deposit of banks has increased by 79 billion while they floated new loans worth a whopping Rs 130 billion. Bankers say that the increasing government expenditure in the third quarter has increased their deposits, while they have curtailed lending due to the rise of their credit-to-core-capital-and-deposits ratio (CCD). The cumulative impact of slow deposit growth compared to credit growth has increased CCD ratio of banks. Banks are not allowed to lend more than 80 percent of their core capital and deposits combined. Lower deposits continue to squeeze banks' ability to lend. Growth in deposits has declined steadily over the past two years since it peaked at 24.2 percent in December 2015. As of third quarter, the average CCD ratio of 28 commercial banks stands at 78 percent. This tighter CCD ratio position requires banks to either increase their deposit stocks or curb their lending to remain under the prudential lending limit. The tighter lending condition means interest rates are less likely to see correction anytime soon. Banks have been offering fixed deposit rate of 11 percent. As the remittance growth has squeezed and the government spending continued to remain low, banks have been seeing a slow growth in their deposits. On the other hand, they are under pressure to increase lending to ensure return to their shareholders in the aftermath of the rise in their paid-up capital. The World Bank recently said that the continued borrowing by the government, even as it accumulated large deposits, is likely to have contributed to the problem. Government borrowing reached Rs 365 billion in February 2018, even as the its deposit in the NRB account stood at Rs 302 billion. “These deposits, which are held at the NRB, effectively remain outside the banking system, and have contributed to creating and sustaining the credit squeeze in the financial system,” read the Nepal Development Update of the World Bank released on Wednesday. The central bank is, however, hopeful that the increasing government spending will help to ease the current shortage of lendable fund in the banking industry.